Lots of pain for hundreds of passengers at the airport, as Erik Lacitis reports in the Seattle Times. Alaska and Horizon Air canceled 78 flights nationwide, and the worst delays were here at Sea-Tac. It’s surely small consolation to the folks who were stuck for hours at the airport, but — until yesterday, at least — Alaska was near the top of the rankings for on-time flights. 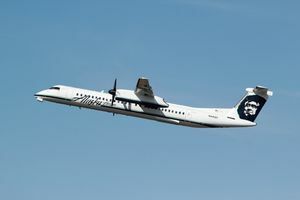 The U.S. Department of Transportation’s most recent data show that Alaska Air flights were on-time 88.6 percent of the time in July 2012, second only to Hawaiian Air. Similarly, for the 12-month period from July 2011 to July 2012, Alaska came in second to Hawaiian with an on-time rating of 88.2 percent. Also, Alaska ranked fifth out of 15 airlines for the lowest percentage of passengers complaints, with .85 complaints per 100,000 enplanements. Hawaiian ranked first in this category, too. Alaska, however, didn’t fare as well in the area of mishandled baggage, ranking 10th out of 15 with 3.45 reports per 1,000 passengers. Top-ranked Virgin only had .97 reports. Yesterday’s meltdown will certainly hurt their ranking for on-time flights, of course, but our hometown airline was doing pretty well until then.